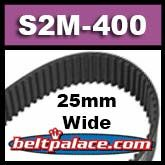 250-S2M-400 STS Belt | Synchronous Belt 250-S2M-400 | Contitech/Bando S2M-400 x 25mm W.
250-S2M-400 STS 2mm Pitch X 400mm Length X 25mm Width. 200 Teeth. *CLEARANCE PRICED WHILE SUPPLIES LAST* Replacement belt for machines and power tools such as CNC Machines, woodworking tools & lathes, pumps, and robotic equipment. STS Synchronous Belt 250-S2M-400 - (Metric Standard). Replaces Contitech/Bando S2M-400 x 25mm W Synchronous belt. Replaces GATES 400-2MGT3-250 Synchronous Belt. ONE LEFT IN STOCK! CLEARANCE ITEMS ARE NON-RETURNABLE.